We are back with a couple of updates. The first tidbit is an addition to Kate’s Calendar for an event taking place this Friday. This promises to be a fun engagement. 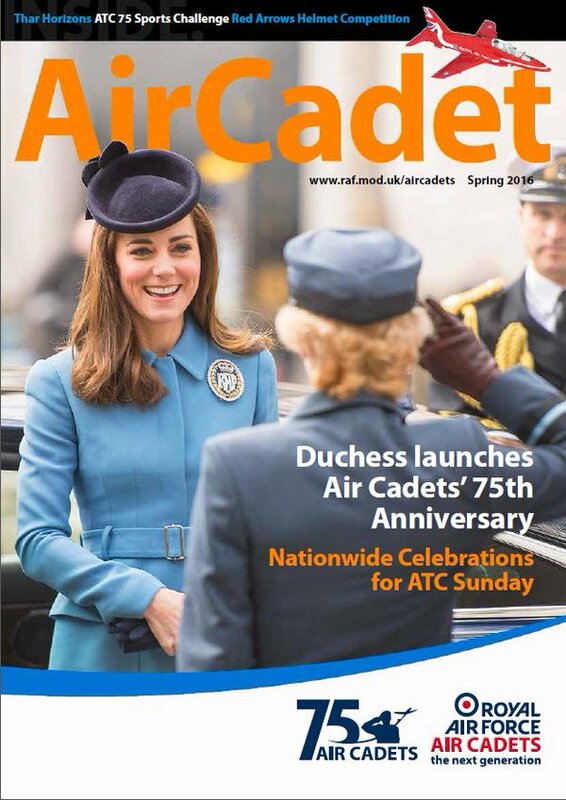 Below, Kate on the cover of this spring’s issue of Air Cadet magazine. People have been asking about Kate at Wimbledon. Unfortunately we don’t have specific information regarding her possible attendance at matches. Friday Andy Murray plays in the men’s semi-finals; we don’t expect Kate to be there because of the Air Tattoo commitment. Should Mr. Murray be victorious in that match he would then play on Sunday in the men’s final; that match is scheduled for a 2pm start on Centre Court. Now to the results of our polls on the clothing, accessories and jewelry worn during that busy week in June when we saw Kate at 7 different engagements. We begin with your favorite dress/coat/coatdress. As many expected, the big winner is the “Nansen” gown from designer Roland Mouret worn to the SportsBall at Kensington Palace. Coming in second, the soft blue Catherine Walker coatdress seen at the Service of Thanksgiving. One interesting note: look how close the voting was for the white Dolce and Gabbana dress worn to Royal Ascot and the ivory Alexander McQueen first seen at Charlotte’s christening, just 22 votes separate those two styles. There was also a clear winner when it came to your favorite chapeau. 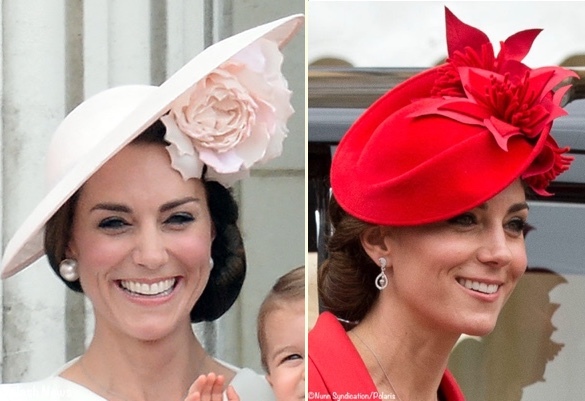 The new Philip Treacy seen at Trooping the Colour easily took the top spot, with the red Lock and Company coming in next among the hat choices. Here’s how the numbers broke out. The final poll on clothing and accessories asked for your preference among the handbags Kate carried. This brought a bit of a surprise, I didn’t expect the red Alexander McQueen clutch to take the top spot. (There’s no real reason, I just wasn’t expecting it.) The LK Bennett Natalie clutch was next in the voting. We also have results from the three jewelry polls, starting with the new piece of jewelry that was your favorite. Kate’s Cartier Trinity earrings were your top choice, with the UFO pearl drops from Royal Ascot finishing second. The previously worn piece you liked the most: the Robinson Pelham acorn/oak leaf diamond earrings first worn by Kate for her 2011 wedding. Once again, the Robinson Pelham diamond pair takes the top spot. Tomorrow we will wrap up our polls, asking for your favorite overall ensemble of the week. Canadian officials are working on a royal visit that would be a match made in paparazzi heaven, featuring Prince William, Prime Minister Justin Trudeau and their equally telegenic families. The visit has yet to be officially confirmed, but it stands to be a crucial moment in the lead-up to the 2017 celebrations of Canada’s 150th anniversary. A formal invitation has been sent and early preparations are under way, sources said. The Prime Minister’s Office is awaiting word from Kensington Palace on the visit, including the potential destinations that the Duke and Duchess of Cambridge would like to visit. Hypothetical dates are in late September and/or early October. The country is approaching its sesquicentennial; Canada’s 150th anniversary will be celebrated throughout 2017. The article generated a significant amount of chatter on Twitter, Facebook and other social media sites this afternoon. The element of the conversation generating the most discussion: whether George and Charlotte would accompany their parents on the trip. Again, there’s no official announcement so we don’t know if the young Prince and Princess would be part of the group making the trip. That a government official would comment on an invitation sent to members of the royal family requesting a visit is unusual, to say the least. Until dates are carved into stone, there is usually radio silence…. You can read Patricia’s entire piece here, the Globe and Mail story may be read in its entirety here. Finally this evening, congratulations to Katie in Wisconsin, she is the winner of our Cornelia James Imogen scarf! Her comment on where she would wear the scarf said “I would wear the lovely scarf to my first salary job after college… and a job I’ve wanted for well over ten years. I think the scarf would be the perfect treat to celebrate!” A big thank you to Cornelia James and to all of you who entered, this one was fun. 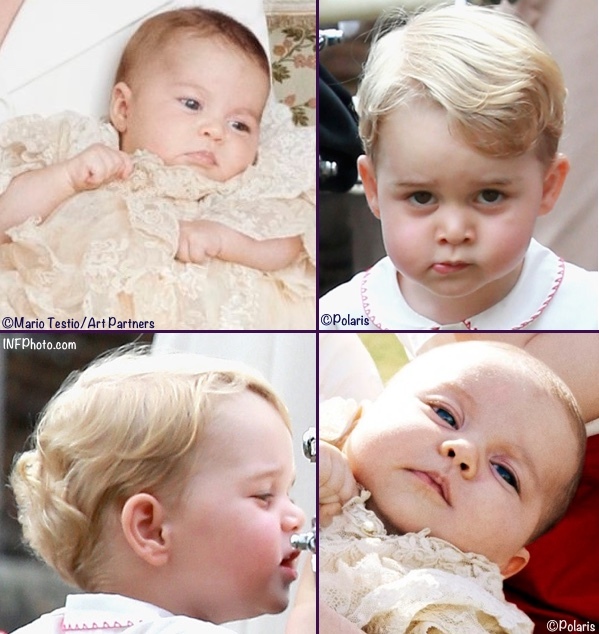 We leave you with two montages from a year ago today when Princess Charlotte was christened. Our original post about the day is here. And here we share the sweet faces of the guest of honor and her big brother. 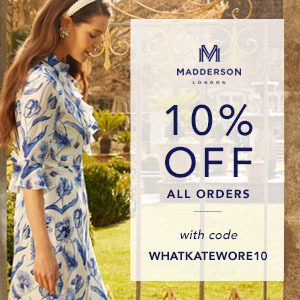 Our original What Kate’s Kids Wore post about the day is here. We’ll see you tomorrow for Kate’s engagement at the Natural History Museum, when she will present the Art Fund’s Museum of the Year award. Will Kate be attending the Olympics? Hey! I’m from Brazil! Very nice to see Kate in Shutz shoes! They are very popular around here. It would be a dream to see her in Brazil for the Rio Olympics! As a Canadian, I must agree that we would very much like them to be here on July 1st. 2017, for the offical celebration day. Kate might be the most unifying force in Canadian politics right now, as people who may not be enthusiastic about the Monarchy, seem to like her very much. She even has a good standing in Quebec, which might be a first for a royal in quite some time. Maybe the pre-announcement and break in protocol was a feeler to see the public’s reaction to them coming so early, and not on Canada Day next year. I think most Canadians would love to see them on the official 2017 celebration, but the government might want them to be here in the fall, to get Canadians educated and interested in the kick off of the celebrations. I think that’s why we’re seeing so much “unofficial” news coming out. As a Canadian, SOMEONE from the royal family has to be invited for the sesquicentennial, preferably being here for the actual day. But my thinking is that if there is going to be another baby Cambridge, it will be next year. If that is the case, given the Duchess’s past history, she won’t be far afield from August through to the end of 2017. Or I could be completely mistaken and all the speculation could come true. Myself, I’d rather like Her Majesty to make a singular exception to her distance travel rule! However, I don’t expect that to happen. Where are Britannia or the Concorde when we need them? A couple of thoughts about Canada. By all rights, a 2017 engagement would go to the Queen. She was in Canada in 1967, for the centenary of the Canadian Confederation, so it would make perfect sense for her to go next year. But, she doesn’t take long trips any more, and it’s doubtful she would be up for a lengthy visit across a vast country. Charles and Camilla have gone frequently, and basically Canadians aren’t interested in them (one of their more recent appearances drew nine people). So, it makes sense William and Kate would get the nod. It still makes more sense for them to go in 2017, but the Canadians might fudge things and do a sesquicentennial kick off this fall if that’s when it fits best into their schedule. It would be kind of unusual for the Cambridges to do two major tours in one year, though, and there are the usual discussions on where they’d go and what they’d see. They’ve already done Quebec, the Maritimes and western Canada. Maybe some stops in Toronto and the prairies? Lovely news about a second date this week for the Cambridges. I know Kate’s there to support air cadets but I can’t help feeling this is one outing tailor-made for William. I wonder if we’ll get some more Kate-faces for the air display as she seems to have by-passed Wimbledon this year. Thanks so much for the lovely polls, they are such a civilised way to spend some quiet time amid a week of the craziest UK news headlines. It’s fun to see what others have favourite though I have to keep reminding myself that most popular doesn’t have to mean best! Having said which, I’m delighted to see I got top runners on the dress, hat, and shoes, and even a runner-up on the handbags. I managed to bomb on the older pieces of jewellery with a distinguished fourth place for the Mappin & Webb pendant, possibly because I felt it was more adaptable than the more ornate wedding earrings. I’ve come to appreciate them better through the enthusiasm of others. And I’d agree to was a surprised to see the red McQueen clutch top the handbag poll as I recall Kate getting some stick hereabouts for having removed the distinctive skull feature. A gothic vibe too far for respectable royalty. Andy Murray will only be playing on Friday if he gets through his quarter-final today, which is due to start in a couple of hours! I think there’s a reasonable chance Kate & William will make an appearance this afternoon. Ah, I forgot she had another engagement tonight. And the one on Friday evening will probably rule out an appearance at the men’s semis. Maybe they’ll take in a ladies’ match for once? Or hope Andy makes it to the final on Sunday! 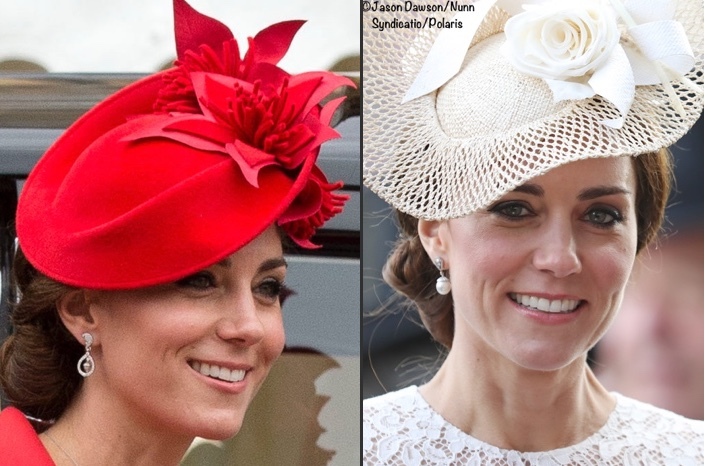 One thing that I observe, and the poll confirms, is that there are Kate style watchers of wildly different styles and tastes reading this blog. From those who identify with Kim K style and those who … do not; those who think lace is on trend, and those equating lace with ladies of a certain age. It’s great, as we can (sometimes) learn from each other. Thanks for the super upper amazing job you do!